Who is Yuval Yeret (@yuvalyeret) ? Yuval is one of these people that I encounter mostly online. I have been following him on twitter, we talk on Linkedin. And somehow, Yuval and I seem to be interested in the same things: visual management, Leanpub books, we seem to be looking in the same direction. People don’t know this although they might guess… I’m a very Visual thinker. I have visual memory, Drawing was quite a serious hobby of mine as a child and to this day I?m fascinated with all things Visual – Sketchnotes, Kanban boards, Story Maps, Post-its, all kinds of Gamestorming activities which emphasize the tangible visual style of things. To top that it is rare to find me without some sort of camera trying to find a good photo of an exercise/meeting? I?m still trying to find my own Visual/Design style for presentations and free-form whiteboard sessions. It?s a hit and miss exploration but I enjoy it a lot. I always wanted to be a fighter pilot but my health profile meant I was destined to be a keyboard jockey rather than a stick-jockey? Really though my passion is finding solutions to complex problems involving systems and people so I guess I somehow would have found myself leading organizations and dealing with systems design concerns. I?ve had many years leading from the front including many of them hands on. Being a servant leader coaching your people and then a full-time coach/consultant with the aim of helping people get to the answers themselves is an ongoing challenge. I?m often on the verge of handing out solutions or urging to go and implement solutions myself. Sometimes I even fall victim to these urges. I believe this search for the) right involvement level challenges me to find creative coaching approaches and exercises while conveying to my clients that I really care about their problems enough to want to get involved. I want to make a difference – have an impact. When working with a client – to look at an organization before and after my involvement and be able to say – yes, there is a certain impact to my efforts. They are now better, and even more importantly they will become better and better over time because of the thinking tools I gave them. 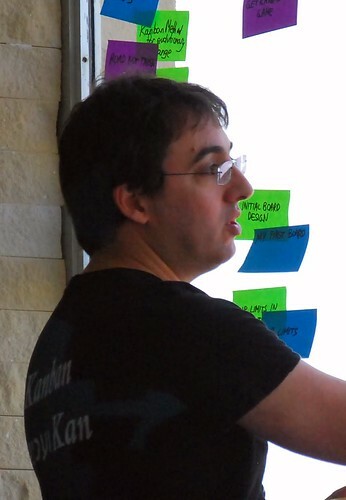 When working with the world-wide and Israeli agile/kanban communities – every time I see a blog post or presentation that touched somebody and sparked a cool conversation or idea, it drives me to invest more time in writing and presenting. I invest a lot of effort into making AgileSparks a world-class lean/agile coaching team because I think as a team we can have much more impact and because I enjoy working with my friends on the team so much. In general, working with bright, fast-thinkers that are able to challenge me is another great driver. Over the years I had the luck to work with many great people whether peers, managers, reports or clients. I noticed that I thrive in the company of these people. Some people say I had a considerable role in opening the Israeli hi-tech market to the concept of Kanban and evolutionary change towards agility. I want to think that my work on Kanban and pragmatic agility in general has helped Agile cross the chasm to mainstream product companies and IT organizations in Israel. are very interesting books I enjoyed and want to get back to. Jeff Anderson. I find his work on Kanban and Change Leadership in Deloitte Canada answers?